Rare combination of dried, shredded daikon radish and kaiware daikon. 1. 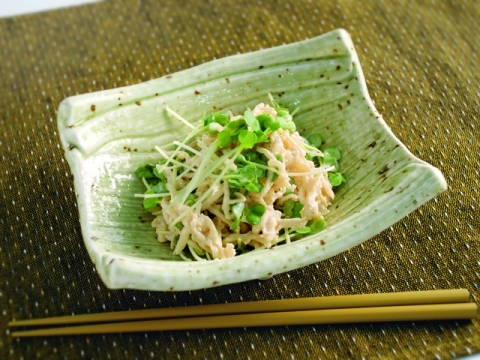 Allow kiriboshi daikon (dried radish) to reconstitute in water, squeeze the water from it and cut into bite-size lengths. 2. Wash kaiware daikon (radish sprouts) with water, and cut into bite-size lengths. 3. Blend all the salad dressing ingredients. Mix in the dried radish and radish sprouts with the dressing.